The Rockland County Solid Waste Management Authority administers and treats the solid waste from wastewater that is generated within the county. 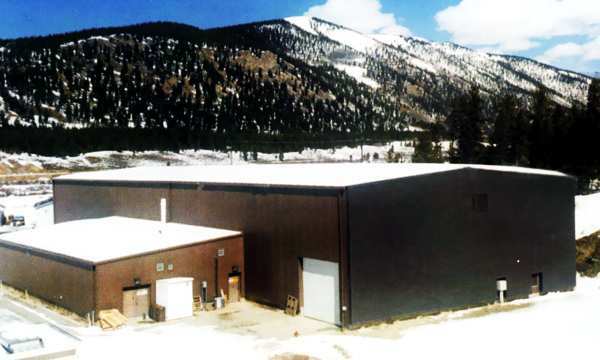 The co-composting facility is one of the buildings that they administer, and in 2005, Dvirka & Bartilucci (D&B) Consulting Engineers were tasked with overseeing a series of process, structural, and energy efficiency improvements. As part of the energy efficiency improvements, D&B Engineers investigated commercially available solar heating systems to offset the large quantities of energy required in the waste drying application. They recommended the SolarWall® technology, which is ideally suited to commercial process drying applications. SolarWall® systems were installed on the southeast and southwest walls to provide heat to two 3-million BTU/hr oil-fired heating systems. The overall project was divided into three systems, and is summarized below. SolarWall® System One: 1,265 ft2 (118 m2 ) of panels were installed on the southeast wall. 11,000 cfm air is preheated and connected to the oil heater on the northeast corner of the facility; SolarWall® System Two: The solar collector area is 3,815 ft2 (355 m2 ) on the southeast facing wall. 17,500 cfm of air is preheated and delivered to the second oil heater on the southwest corner; SolarWall® System Three: Covers 2,900 ft2 (270 m2 ) on the southwest wall. Designed for preheating 17,500 cfm of air, which is also connected to the second oil heater.